we have tagged an updated 2017.334 release on Github . The main change is the addition of the caps_plugin to Seedlink which allows to acquire data from our CAPS waveform server, e.g. data from the RaspberryShake network. 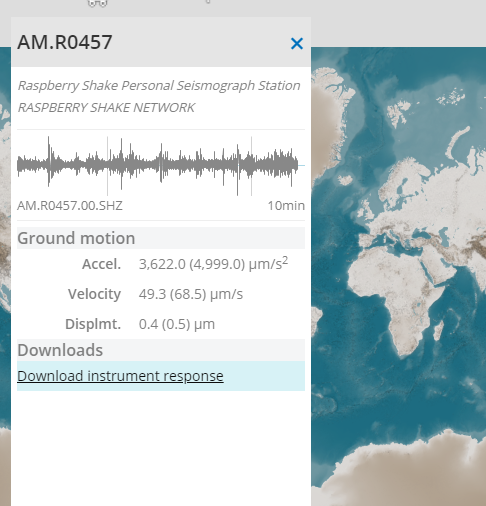 can’t we access station from RaspberryShake Network from chain TCP/IP? where to download inventory xml of it? Your browser is not supported officially! You can use it at your own risk but be aware that visual distortions or even browser crashes or freezes may occur. Once the station map is open, click on one of them and you will see a drop-down window on the left of the screen (see the figure below). In the Downloads option you can obtain the xml file for that station (Download instrument response). And download all the stations xml. But data is not accesible in real time by a public seedlink port.